I know eggs aren't that impressive, but I've always wanted to make a perfect omelet. You know, the kind you see the chefs making at the omelet station at a breakfast buffet. I'd watch them in awe as they made flipping the omelet without a spatula look like the easiest thing in the world. I never dared to try it in my own kitchen (I'm sure Jon's happy about that since I cook and he cleans up! 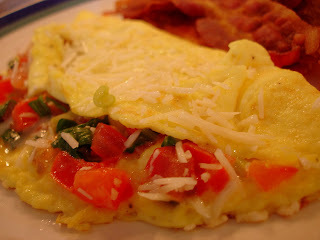 ), but I have tried a few different ways to make a beautiful omelet. Well, I think I finally did it yesterday! I melted butter in a non-stick pan. To it I added chopped tomatoes and green onions, and after 1 minute I added chopped spinach. After 4 minutes I set the veggies aside in a bowl. In the same pan I melted a little more butter, and then added my eggs (the eggs had been whisked in a bowl with milk and pepper til light and full of air). I kept the heat on medium-low and just let the eggs sit. After a few minutes I did a slight turn of the pan to move the liquid around and off the center. Finally almost the entire egg was stiff except for just a little bit of liquid on top, but it was not a watery consistency at all. I threw the veggies onto the eggs, added some Parmesan and mozzarella cheese, folded the omelet, and let it cook for 2 more minutes. It was picture perfect and delicious - just what I wanted! this is too funny! my fiance has been completely obsessed with making the "perfect ommelet" - but since we've never gotten there, there have been many kitchen tirades. congrats on your perfect ommelet! Isn't it funny how something that seems so easy can be so frustrating! My omelets always look like crap. Thanks for the tips. Maybe I'll try again this weekend.